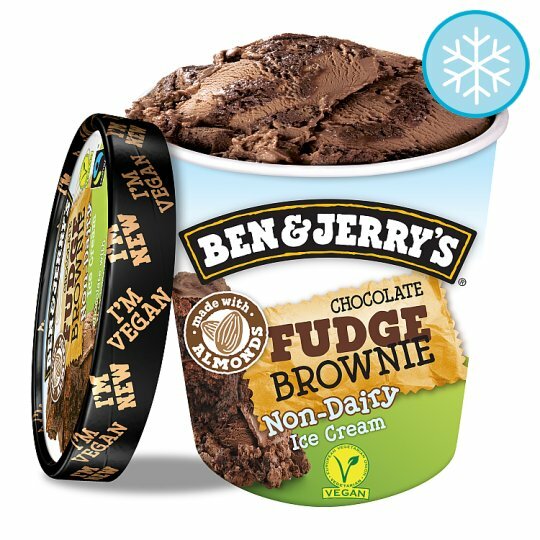 Decadent chocolate with fabulously fudgy brownies in a 100% vegan-certified Non-Dairy version of a Ben & Jerry’s hit flavour. Some might call it impossible, we just call it dessert. It took three years of tasting and tweaking to perfect Ben & Jerry’s Non-Dairy recipe. Ultimately, almond milk is what made the magic happen, creating the smooth and creamy texture you crave. Of course, achieving all the funky chunks and sweet swirls – without dairy, eggs, or honey – was no simple task. Yet the work (and wait) was worth it. In fact, the finished product is so good that, in the case of Chocolate Fudge Brownie, many devout dairy fans are giving praise to the almond milk alternative. Equally awesome is that the brownies in this Non-Dairy fan favourite come from Greyston Bakery, located in Yonkers, New York. Since 1982, this social enterprise has been battling poverty by offering education and employment to residents who need it most. The good vibes don’t stop there. All of Ben & Jerry’s dairy-free ice creams are made with non-GMO-sourced, certified vegan ingredients, and Fairtrade certified sugar, cocoa, and vanilla. Not to mention that all the goodness is wrapped in responsibly sourced packaging so you can feel good about what’s in your freezer.